The surname of Crawford comes from the barony of Crawford, adopted around 1125 when Norman knights who came with King David I when he returned to Scotland to assume the throne and instituted Norman feudalism. The name is taken from the barony of the same name in Lanarkshire. The early names of all of the principal Crawford families are all Norman, however some scholars have asserted an Anglo-Danish ancestry. There is a tradition that Reginald, who was a son of the Earl of Richmond was one of the Norman knights who were established by David I of Scotland. The Crawfords appear in a legendary incident when the king's life was saved from a stag and this led to the foundation of Holyrood Abbey. It is said that Sir Gregan Crawford was instrumental in saving his royal master's life. John Walkinshaw Crawford, the twentieth Laird was a distinguished soldier who joined the army at an early age and rose to the rank of Lieutenant-Colonel. He fought in the victory at the Battle of Dettingen in 1743 against the French. Two years later he also distinguished himself at the Battle of Fontenoy. However despite his faithful service to the house of Hanover, during the Jacobite rising of 1745, he was also a faithful friend of the Jacobite Earl of Kilmarnock (chief of Clan Boyd). In a last act of comradeship he followed Kilmarnock to the scaffold where he received the earl's severed head and attended to the solemnities of his funeral. As a result his name was placed at the bottom of the army list, although he was restored in 1761 and appointed falconer to the king. He died in 1793 and left his entire estates to Sir Thomas Coutts. However this was contested by Elizabeth Craufurd, who eventually won her case in the House of Lords in 1806. This branch of the clan united the families of Houison and Craufurd and they still live at Craufurdland. Sir Alexander Craufurd of Kilbirnie was created baronet in 1781 and his son, Robert Craufurd, commanded the Light Division in the Peninsular War. He died in 1812 leading his troops in an assault on the fortress of Ciudad Rodrigo. A monument was erected to him in St Paul's Cathedral, London. Hugh Crawford, the twenty-first Laird of Auchinames, emigrated to Canada having sold the ancient clan lands in the early twentieth century. The modern crest badge of a member of Clan Crawford contains the crest: a stag's head erased Gules, between the attires a cross crosslet fitchée Sable. Encircling the crest on the crest badge is a strap and buckle engraved with the motto: TUTUM TE ROBORE REDDAM which translates from Latin as "I will give you safety through strength". The Crawford tartan is of relatively modern origin, and it is certain that there was no Crawford tartan in around 1739. The first record of a Crawford tartan is that of the "Crawfovrd" which appeared in the Vestiarium Scoticum of 1842. 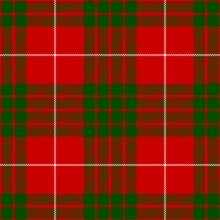 This is the Crawford tartan used today. The Vestiarium was the work of the Sobieski Stuarts whose influential book purported to be a reproduction of an ancient manuscript about clan tartans. Today many clan tartans are derived from the Vestiarium. 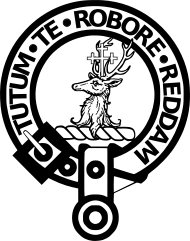 ^ a b c Clan Crawford Profile scotclans.com. Retrieved 28 September 2014. ^ a b c d e f g h i j k l m n o p q r s t u v w x y z aa ab ac ad ae af ag ah ai aj ak al am an Way, George and Squire, Romily. (1994). Collins Scottish Clan & Family Encyclopedia. (Foreword by The Rt Hon. The Earl of Elgin KT, Convenor, The Standing Council of Scottish Chiefs). pp. 374 - 375. ^ a b c d e Coventry, Martin. (2008). Castles of the Clans: The Strongholds and Seats of 750 Scottish Families and Clans. pp. 128 - 130. ISBN 978-1-899874-36-1. ^ Way, George; Squire, Romilly (2000). Clans & Tartans. Glasgow: HarperCollins. ISBN 0-00-472501-8. ^ "Tartan – Crawford". Scottish Tartans World Register (scottish-tartans-world-register.com). Retrieved 26 September 2008. ^ Robertson, George (1823), A Genealogical Account of the Principal Families in Ayrshire, more particularly in Cunninghame. Vol.1. Pub. Irvine: Cunninghame press. p. 197. 7. George Crawfurd, Laurus Crawfordiana. Transcribed and annotated by Raymond Crawfurd, Published by Clan Crawford Association, 2013.